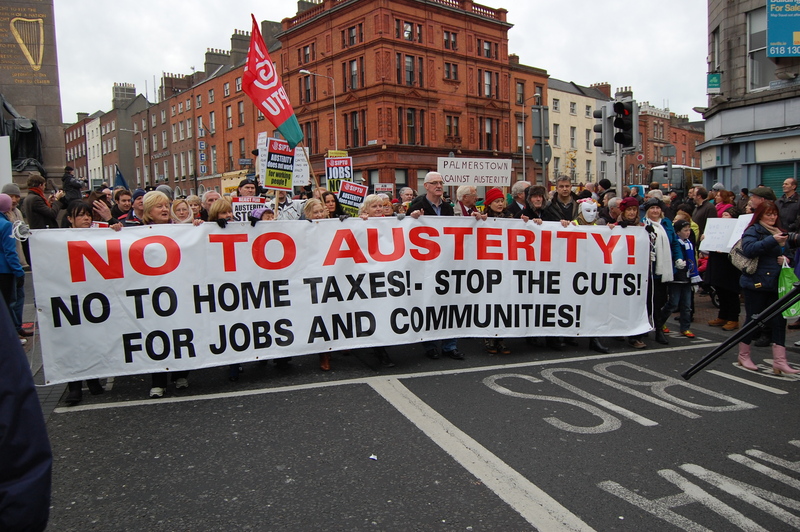 Thousands of working people from around the country marched in Dublin yesterday against austerity. 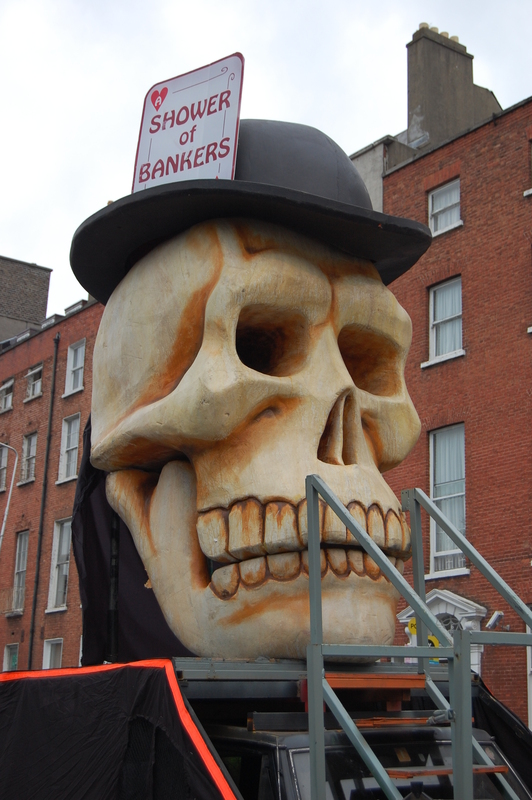 The demonstration had been called by the Dublin Council of Trade Unions and by other groups. While not on the scale of the earlier demonstrations in 2008 and 2009 it was nevertheless a large protest against the government. That it was smaller should not be surprising since in the meantime the people of the state have voted in a referendum, reluctantly of course, to support austerity. The Garda initially estimated that there were 18,000 on the demonstration and later reduced that number to 10,000. In my own view, at its height, the former figure was closer to the truth. In this post I want to give my own impressions of the demonstration and in a further post look at some of the issues raised by it. The demonstration was very diverse with lots of banners and placards from many different organisations and places around the State. This diversity was not unfortunately united around any very clear or coherent perspective of opposition or alternative. If it had a unifying theme it was simply one of opposition to austerity and opposition to the Government. However what the demonstration did show was the potential to build some sort of opposition. Unfortunately the organisers offered no means for those who might attend to either meet beforehand or afterwards to discuss what an opposition might look like, how it would come together to organise itself and on what policies it might unite. In the age of the internet it should not be impossible to register groups and individuals’ interest in a demonstration beforehand and call a conference to discuss the demonstration and what everyone attending might want to come out of it. On the other hand the demonstration itself could have been used to issue a single predominant leaflet advertising such a conference. As ever these demonstrations seem to unite those prepared to protest for one afternoon, only for them to disperse and go their separate ways again. The largest contingent on the demonstration seemed to be the Campaign Against the Household and Water Taxes (CAHWT) with banners from various localities in Dublin and other cities and towns across the State. 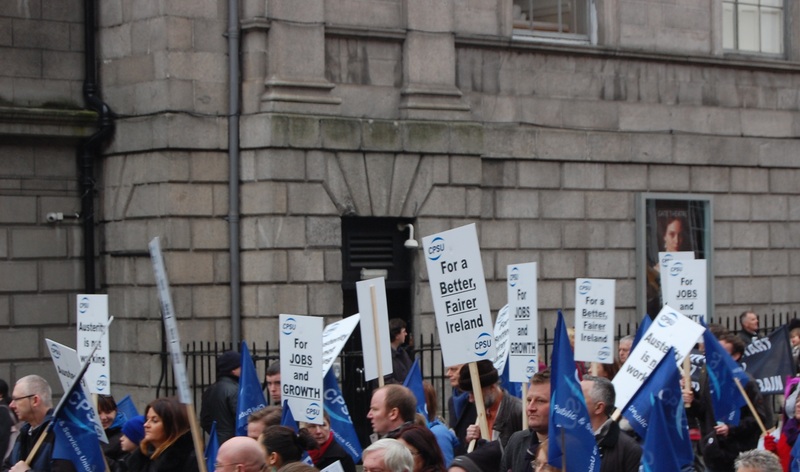 There were also large contingents from various trade unions including the Communication Workers Union, TEEU and SIPTU. They were large by the standard of the demonstration but obviously not at all in relation to the size of their memberships. The unions had obviously mobilised some of their activists but had not built more widely inside their union or across the movement. A comrade had mentioned to me that he had looked at the union web sites that morning and it was clear that they had not sought to really build the demonstration. The Communication Workers Union held up placards ‘for a better fairer Ireland’(while their band played the Internationale), no doubt in reference to the Irish Congress of Trade Union’s ‘better fairer way.’ Unfortunately we’ve already got this better fairer way as far as the trade union leadership is concerned. They have negotiated a deal with the Government – the Croke Park deal – which has involved acceptance of austerity with no more than verbal opposition and the odd protest allowed. The Croke Park deal requires that the trade unions not take industrial action and the union leaderships have ensured that this has been the case. They seem happy enough with the present situation because they are about to go into negotiations for a Croke Park II with the Government setting a condition of a €1 billion cut. This is proving no barrier to entering the talks. The various community campaigns took up a large part of the demonstration and the rest by the various political parties. Sinn Fein had the largest contingent of a political party, taking up the rear of the march. Labour Youth also had a banner and a very small contingent. This was brave enough given their Party’s role in Government but at least they had the decency to look a bit sheepish. These young comrades must certainly know that their task, if they insist on staying in the Party, is to build an opposition within it to the leadership and demand it withdraw from the Government and never enter another one like it. There were banners and members from People before Profit/SWP, Socialist Party, United Left Alliance, Communist Party, Socialist Democracy, Irish Socialist Network, Workers Solidarity Movement, Republican Sinn Fein, 32 County Sovereignty Movement, Republican Network for Unity and Erigi – all in favour of the unity of the working class or of the nation. There was no predominant chant from the demonstration; the odd ‘they say cutback, we say fightback’ and chants against paying the household charge. 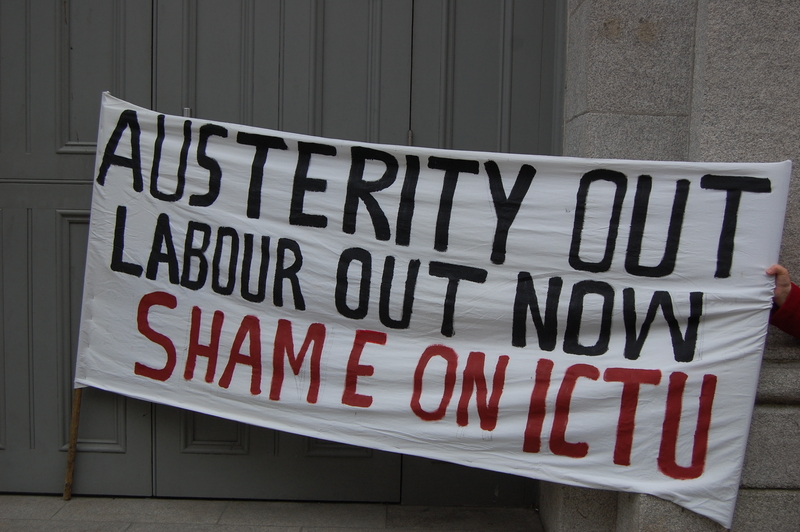 Socialist Democracy (SD) and their supporters held up a banner at the side of the demonstration as it left Parnell square and called for ‘Labour out of Government, ICTU out of Talks’ and ‘No new Croke Park’. A demonstration united around these demands would have been a more powerful expression of opposition. It would have targeted the weakest part of the Government and the key task of the moment – stopping ICTU and the trade unions selling out to the austerity drive once again. It must be clear that preventing the trade unions’ acceptance of cuts would be a real victory, and would be a first step to really opposing them. Failure to do so would make it much more difficult to achieve this. The many on the Left calling for a general strike should realise that such calls mean very little if the prior step of preventing ICTU from signing up to a Croke Park II is not achieved. There were one or two calls from small parts of the demonstration for calling a general strike and in my next post I will look at this demand. Whether or not the Socialist Democracy call had some effect I do not know but a couple of sections of the demonstration took up their point about the Labour Party. One SD member told me that the CAWHT contingents had reacted enthusiastically to their loudhailer demands, the trade union contingents had reacted with silence and the SIPTU contingent had attempted to raise an alternative chant to drown them out. At the end of the demonstration what was left of the protest waited outside the GPO for the speeches. I waited a while as well as some music was played. I was talking to a fellow Marxist when he said he was debating whether to wait to listen to the speeches or do some shopping. I was in the middle of telling him I was debating the same issue myself, but felt obliged to stay since I was going to cover it in the blog, when I realised that over 90 per cent of the demonstration had left and that I could leave as well without doing an injustice to most participants’ experience of the day. It was later reported that one of the speakers, the current President of the Irish Congress of Trade Unions, Eugene McGlone had joined in calls for a general strike in protest at austerity and cutbacks and that other speakers had echoed this call. He was initially heckled when he took to the platform as was SIPTU President Jack O’Connor who said that ‘while he is not necessarily opposed to a day of action against austerity, unions would have to be able to convince the overwhelming majority of workers that the objectives they were advocating were achievable and were a better alternative.’ Sounds like a job description to me but not obviously one that Jack recognises. RTE also reported that ‘the organisers of the pre-Budget anti-austerity protest have condemned what they describe as “the divisive attack” (on) Mr O’Connor (by) a section of the crowd. In a statement, Councillor Brid Smith said: “Nobody orchestrated any heckling – it was a spontaneous outburst of anger at the inaction of union leaders. Some highly-paid union bosses appear so much out of touch with the anger of their own grassroots that they see conspiracies everywhere,” she added. We can be in little doubt that McGlone’s call is indeed a ‘solo-run’ but that unfortunately it is not “the inaction of union leaders” that is the problem but rather their actions that are. In negotiating a deal with the Government which accepts austerity and agrees not to organise effective action against it they have consciously adopted the role of enforcing Government and Troika policy. Their actions, in appearing to be concerned only with their members in the public sector, has effectively validated and supported the strategy of the Government, bosses and media of dividing workers into public versus private and making easier the imposition of austerity on both. Attacking O’Connor is not “divisive” because these leaders have agreed a deal which supports austerity. That he was allowed and able to speak at an anti-austerity rally shows how far Irish workers have to go to build a real opposition to it. What is heartening is that some workers seem to appreciate this.